Climate Skeptic, Koch-Funded Scientist Richard Muller Admits Global Warming Real & Humans the Cause | Democracy Now! professor of physics at the University of California, Berkeley. He co-founded the Berkeley Earth Surface Temperature project. He is the author, most recently, of Energy for Future Presidents: The Science Behind the Headlines. Richard Muller’s admission has gained additional attention because some of his research has been funded by Charles Koch of the Koch brothers, the right-wing billionaires known for funding climate skeptic groups like the Heartland Institute. Richard Muller is the author of the newly published book, Energy for Future Presidents: The Science Behind the Headlines. Welcome to Democracy Now!, Professor Muller. Talk about your change. RICHARD MULLER: Well, I felt there were legitimate issues that had not been addressed. There’s the whole issue of climate change and whether hurricanes are increasing and so on, but the most solid evidence was the temperature data, and questions had been raised. The stations that were used were of poor quality. Could that be addressed? Could you use such data? There were issues that prior groups had highly selected the data—in the U.K., using only 5 to 7 percent of the data, here in the U.S., only 20 percent of the stations. It was a concern whether they had picked stations that showed warming and not the others. There were other issues, too, about the influence of urban heat islands. Cities get warmer, but that’s not the greenhouse effect. So, is that—how do we estimate the greenhouse effect? And there was the data adjustment and then the huge computer programs that they used to make the attribution to humans. All of these things deeply concerned me, and I could not get the answers in a satisfactory way. As a scientist, on such an important issue, I felt it was my duty to be what I would call properly skeptical. And the only way to answer this was to put together a program. So, we gathered together a group of truly eminent scientists, so people who are really good at analyzing data. These include Art Rosenfeld, who’s a hero in the energy conservation field, and Saul Perlmutter, who actually last December, after working on our project for a year, over a year, was awarded the Nobel Prize in Physics, not for work he was doing for us but for prior work he had done in astrophysics. So, it began to come together about a year ago. We were able to show that the poor station quality, although it affected the temperature measurements, didn’t affect the temperature changes. We were able to use 100 percent of the data, not the 20 percent that others had used. We found that data selection bias didn’t affect things. We looked at the urban heat island. It came together. We concluded that global warming was indeed real. But then, about three to six months ago, thanks largely to the effort of a brilliant young scientist named Robert Rohde, who we hired to do and use the best possible statistics in order to be able to use all the data, he was able to push our record back to 1753. That’s before the American Revolution. That’s back when the measurements in the U.S. were being made by Benjamin Franklin and Thomas Jefferson. With that long record, we could look for the fingerprints. We could see how much was due to volcanoes, how much was due to ocean currents, how much was due to the variability of the sun. We could do this much better than people had done before. AMY GOODMAN: And what has been the response of your colleagues, those who, like you, have been skeptical for so long? RICHARD MULLER: Well, I don’t expect people to say, “Oh, Muller has changed his mind, therefore I do.” What we’ve done is, I think, an exceptional level of transparency. We have five detailed scientific papers, which we have placed online. These have all been submitted to peer-reviewed journals. We have put all of the data online. We’ve put all of our computer programs online, along with a lot of supplemental information that your watchers and listeners might like. If you go to berkeleyearth.org, you’ll find—you can look up the temperature record in your hometown or your home state. But by putting this online, we have a transparency where people who think we did something wrong can find, well, this is your assumption right on this line here, this is what we don’t like. And our responses is, OK, change it, see if it makes a difference, or we can change it for you and see if it makes a difference. So, this is, I think—the wonderful thing about science is that it’s that narrow realm of knowledge on which we expect to achieve universal agreement. I believe that some of the—most of the skeptics—there were some deniers who refuse to pay any attention to the science, but many of the skeptics recognized there were valid problems with the data. And we have now directly addressed those. So my hope is that as they study our work, that they will recognize that we did address these in the proper way, and that now the—now we can agree on the science. How you address this, what you do on the international arena, is a separate question. AMY GOODMAN: I want to ask you about the role of Congress in the climate debate, Dr. Muller. On Wednesday, the Senate held its first hearing on the topic in more than two years. The Republican-controlled House has turned down 15 requests from Democrats for a similar hearing. Senator Barbara Boxer, of course Democrat of California, your state, who chairs the Environment and Public Works Committee, opened the session. SEN. BARBARA BOXER: Colleagues, climate change is real. Human activities are the primary cause, and the warming planet poses a significant risk to people and the environment. I believe to declare otherwise is putting the American people in direct danger. The body of evidence is overwhelming. The world’s leading scientists agree, and predictions of climate change impacts are coming true before our eyes. The purpose of this hearing is to share with the committee the mountain of scientific evidence that has increased substantially over time—time that I believe we should have used to reduce carbon pollution, the main cause of climate change. AMY GOODMAN: Most of scientists who testified said human activity has accelerated climate change, intensified a recent U.S. heat wave, and raised sea levels. But much of the hearing was dominated by senators bickering over the science. Senator James Inhofe of Oklahoma, the ranking Republican on the committee, echoed points from his recent book, The Greatest Hoax: How the Global Warming Conspiracy Threatens Your Future. His points were disputed by independent Senator Bernie Sanders of Vermont. SEN. BERNIE SANDERS: Now, Senator—Senator Inhofe has said repeatedly, recently just the other day on the floor of the Senate and in his book, which I am reading—I am reading it. He gave it to me very kindly, and I’m going to read every word of it. He said that, in his view, global warming is the greatest hoax ever perpetrated on the American people. Now, my understanding is that NOAA says global average surface temperatures have increased 1.3 degree Fahrenheit since 1900. NASA says the global average surface temperatures of this planet have increased by 1.5 degrees Fahrenheit since 1880. Dr. Richard Muller recently wrote an article in which he said that the planet has warmed 2.5 degrees Fahrenheit over the last 250 years. So, either NASA, NOAA and many other scientists are correct in stating that the planet is warming, or perhaps Senator Inhofe is correct that global warming is a hoax. AMY GOODMAN: That’s independent Senator Bernie Sanders. Professor Muller, your response? RICHARD MULLER: Well, I’m hoping that our study on global warming will help achieve the sort of scientific consensus. I understand why many of the skeptics in Congress have opposed—have opposed it in the past. I’ve been there, I’ve talked to them in the past, and they had raised issues which were ones that I considered value—correct, issues that now I think we have raised. You know, just because global warming is real doesn’t mean that everything attributed to it is real. Hurricane Katrina was not caused by global warming. 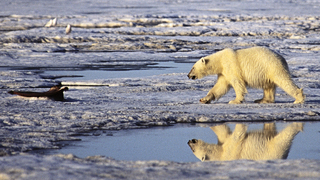 Polar bears are not dying because of global warming. A heat spell in France—even the recent record year of temperatures in the United States is not a result of global warming, because if you look at the complete detail, you’d find it was matched by more than cooling elsewhere in the world. So, many people attribute every change in the weather to global warming, and I can understand why people object to that. But the temperature change itself is real, and it is due to humans. And I think, because I now feel that this is true, and I think we could make the scientific case more solidly than had been made in the past, I think this does say we do need to take action, and we do need to do something about it. AMY GOODMAN: What is your message, particularly to Republican lawmakers like Senator Inhofe? And were you consulting with them before your conversion? RICHARD MULLER: Oh, yes, I’ve met with both the Republicans and the Democrats and explained things to them. I’ve been asked to come several times to Washington, D.C. The message, however, is not an easy one, and I find nobody really likes my message, neither the Republicans nor the Democrats. My new message is there are two things that must be done if we’re going to stop this. There are many things you can do. We each can do our part. You know, we can get higher-mileage automobiles and all that kind of stuff. But from the world point of view, there are only two big things that can be done. One of them is an extensive program in energy conservation and energy efficiency. This is absolutely essential, and there are huge gains to be made. The fact is, energy efficiency and conservation are profitable. And that’s really important, because, unfortunately, most of the global warming, most of the carbon dioxide, is going to be coming not from the U.S. but from China. Anything we do must be something that can be emulated and followed in China. Electric cars, for example, don’t do any good. If a Chinese person switched from a gasoline car to an electric car, he would wind up producing more carbon dioxide, because that electricity is coming from coal, and that’s worse than gasoline. So, we have to do things that will have an impact. The other thing we need to do is—and this is one where, unfortunately, a lot of my Democrat friends have a knee-jerk reaction against it, but I think it’s essential—we have to get the Chinese to convert, to move over, get away from coal into a natural gas economy. By the end of this year, China will be producing twice the carbon dioxide of the United States, and whereas our carbon dioxide is going down, their carbon dioxide is shooting up. So it will get worse and worse. Natural gas produces only one-third of the carbon dioxide that does coal. And the coal chokes their citizens, too. Now, in the U.S., a lot of people say, “Oh, fracking is bad. It’s dirty,” which is true, “and it’s a fossil fuel.” Well, China can’t afford—will not be able to afford massive solar and massive wind for several decades. In the meantime, soon they’ll be producing more carbon dioxide per person than we are. So, we have to help them, expedite them switch over to natural gas, that has one-third of the emissions of carbon dioxide. Anything we do in the U.S., if we ignore China, is not really addressing the problem. AMY GOODMAN: When Democracy Now! was at the U.N. Climate Change Conference in Durban this past December, I spoke with Marc Morano, publisher of Climate Depot, a website run by climate denier group Committee for a Constructive Tomorrow, and I asked him about President Obama’s record on climate change. AMY GOODMAN: That’s Marc Morano, publisher of Climate Depot, run by the website—the climate denier group Committee for a Constructive Tomorrow. Dr. Muller, your response? RICHARD MULLER: Well, I think that in opposing any—joining the Kyoto agreement, President Obama recognized that the non-involvement of China made our participation—would not have done much. At Copenhagen, President Obama went there to try to get the Chinese involved. He insisted on having inspections, because the Chinese rate of growth, they’ve averaged 10 percent growth over the last 20 years. That growth is so enormous that they are going to dominate the global warming—global warming of the future. And if they wouldn’t even allow us to inspect, then we can’t do—if we were, in the United States, to cut back to zero—ridiculous, but let’s say we cut back to zero emissions—within three-and-a-half to four years, the emissions would be back where they were just from the growth of China. So I think President Obama has done the right thing in insisting that China must be involved. In the proposed Copenhagen treaty, they were going to slow their growth to 6 percent per year rather than cut it to zero. And even at that, they would be surpassing us. So I think he’s done the right thing. Now, what we need to do, I believe, is to—we need a presidential program, a national program, in which we will share our technology. No, we don’t want dirty fracking in China any more than we want it here, but we can make it clean. It’s just a matter of using the technology to assure that it will be clean, that it won’t cause earthquakes and so on. That, as a technical problem, is not that difficult. We need to share our technology with them to help them switch away from coal, which is what is going to be responsible for the global warming of the future. AMY GOODMAN: Richard Muller, you’re known for your change of heart on climate science, your “conversion,” as you’ve described it, and it’s come fairly recently. I want to play a comment you made during a 2009 interview. RICHARD MULLER: One, you have to recognize how bad it is. And the surprising answer is that so far it hasn’t been very bad. We’ve had about one degree Fahrenheit of global warming so far, none whatsoever in the last 10 years. You need to know that, because otherwise you will misunderstand. When people criticize global warming and say it’s not real, the reason they’re saying it’s not real is there hasn’t been any in 10 years. But we don’t expect it to happen every year. It’s a gradual thing that builds up. AMY GOODMAN: Professor Muller, that was you speaking in 2009. Is this still your opinion? RICHARD MULLER: Oh, yes. In fact, my former book, Physics for Future Presidents, goes through Vice President Al Gore’s movie, An Inconvenient Truth, and I think correctly shows that essentially 90 percent of what he presented was exaggerated or distorted or just false. But I think part of the problem here is that when we attribute every change in the weather to climate change, we engender a lot of skepticism. And that, I think, in the end, has done some harm. I think science has hurt itself by exaggerating the case. Global warming, so far, has not been very much. In the last 50 years, it’s been two-thirds of a degree Celsius, over—well, one degree Fahrenheit, and that hasn’t been much. One-third of the cities in the United States have cooled over the last 100 years. Astonishing statistic, but not surprising when you realize that local variations are much larger than this one-degree change. The danger isn’t that we have done harm. The danger is that we understand that this will continue to go up, that in the future, what is now two-thirds of a degree will become one, two, three degrees, and that that will be warmer than Homo sapiens have ever experienced. So, I believe we need to act, but we need to act in a way that recognizes the problem isn’t with us, the problem is with the world, particularly with the extensive coal that is used around the world, in the developing countries. If we don’t address that, then we are just playing games. We’re going to say, “Oh, hey, we—you know, I have an electric—I have a Prius. Hey, I’m not to blame. I did my part.” No, that’s baloney. We need to address the real problem, which is the extensive coal burning, and we have to bite the bullet and recognize that natural gas is the only thing that can get us there over the next 20 years, that and energy conservation. Energy conservation is win-win. I believe the Chinese will adopt that. We should help them adopt that, because that is something where they can earn money at a great return, better than Bernie Madoff, but it’s legitimate. You can—again, my new book discusses in detail the many places where you can get a profit of 20 percent, 30 percent per year just by investing in energy conservation. So that combination of energy conservation, on one hand, and then the switch to the natural gas economy via clean fracking, on the other hand, I think can get us through to the era when China and India can afford solar and the upcoming technologies that will finally get us away from fossil fuels. AMY GOODMAN: Finally, Professor Muller, I wanted to get your response to Michael E. Mann, the director of the Earth System Science Center at Pennsylvania State University, who wrote on his Facebook page, “There is a certain ironic satisfaction in seeing a study funded by the Koch Brothers—the greatest funders of climate change denial and disinformation on the planet—demonstrate what scientists have known with some degree of confidence for nearly two decades: that the globe is indeed warming, and that this warming can only be explained by human-caused increases in greenhouse gas concentrations. I applaud Muller and his colleagues for acting as any good scientists would, following where their analyses led them, without regard for the possible political repercussions.” Your response to Michael Mann and to your Koch-funded research and what this means for them? RICHARD MULLER: Well, the Koch Foundation provided about one-quarter, or maybe it was one-sixth, one-sixth of our funding, and they made it clear to us that why, the reason they funded us, was because we did recognize that these issues were real, issues that Michael Mann didn’t accept as real, but I think he was wrong. I think there were valid questions, and we addressed them, and they’ve expressed nothing but delight that we have been able to reach a conclusion. So I think this cartoon-like characterization of the Koch Foundation as being right-wing deniers, I found that to be completely wrong. Michael Mann, on the other hand, has published a lot of things that I disagree with. He has claimed that there was no—that there was no Medieval warm period, that it’s been the warmest now it’s been in a thousand years. And I was a part of that National Academy study that basically demonstrated that his conclusions were wrong. So, no, he and I don’t agree on lots of things. AMY GOODMAN: But, Professor Muller, your fundamental conversion—your fundamental conversion is that climate change is largely human-caused. AMY GOODMAN: But global warming—no, we just have 10 seconds. RICHARD MULLER: Just global warming, yes. Global warming is human-caused. AMY GOODMAN: Well, I thank you very much. AMY GOODMAN: Richard Muller, professor of physics at the University of California, Berkeley. His op-ed piece, “The Conversion of a Climate Change Skeptic.” I thank you very much for being with us. This is Democracy Now!, democracynow.org, The War and Peace Report. His book is called Energy for Future Presidents: The Science Behind the Headlines. Back with Bill McKibben in a minute.